Parents who let their toddlers play with iPads could be damaging their hands and fingers, an expert has warned. Occupational therapist Lindsay Marzoli says that excessive screen time could cause children long term damage. 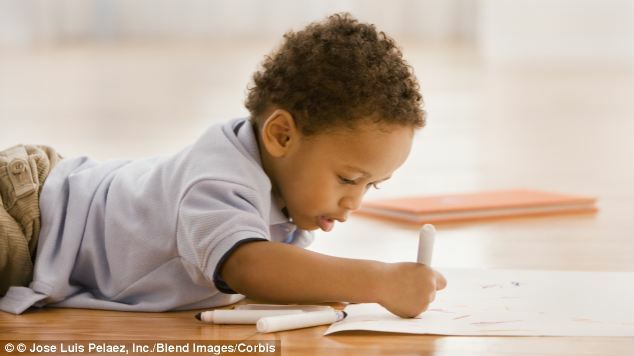 Ms Marzoli, of the Learning and Therapy Corner in Maryland, U.S., told CBS Local: ‘If they are always on the iPad and not actually doing those paper and pencil activities that they should still be doing, those muscles are going to remain weaker. Experts say the problem is that the technology is so new researchers do not know what damage it might cause in the long run. New guidelines from the American Academy of Paediatrics state children should not be allowed more than two hours screen time a day. They also say children under the age of two should not spend any time in front of a screen. Finally, the guidelines suggest televisions, tablets and computers should be kept out of children’s rooms. The research is not the first to suggest excessive screen time can harm children’s health. Research commissioned by Abertawe Bro Morgannwg University Health Board suggested youngsters face a ‘healthcare time bomb’ of neck and back pain linked to the use of computers, video games and smartphones. The research showed nearly three quarters of primary school children, and two thirds of secondary school students, have reported back or neck pain within the last year. Physiotherapist Lorna Taylor said: ‘Modern lifestyles and the increase in technology are having detrimental effects on our children’s musculoskeletal health and, if not addressed in school and at home now, will have far reaching effects for our children, the future working generation and society.